Thalamic alterations remote to infarct appear as focal iron accumulation and impact clinical outcome. Thalamic alterations remote to infarct appear as focal iron accumulation and impact clinical outcome. Kuchcinski G, Munsch F, Lopes R, Bigourdan A, Su J, Sagnier S, Renou P, Pruvo JP, Rutt BK, Dousset V, Sibon I, Tourdias T.
Post-stroke outcome includes not only functional outcome (the physical consequences of ischemic stroke), but also cognitive impairment and emotional disorders (depression, anxiety) that are major causes of disability. The thalamus being a central hub of several cognitive networks, we hypothesized that thalamic alterations might be an important contributor to such long-term outcome. We further hypothesized that thalamic alterations could occur after an infarct initially sparing the thalamus but interrupting thalamo-cortical or cortico-thalamic projections. In more details, specific nucleus within the thalamus might be differentially altered depending on the location of the cortical infarct and therefore on the projections that have been disconnected. Highlighting such regionality of secondary modifications within the thalamus after stroke might be relevant for recovery because individual thalamic nuclei drive specific functions especially for cognitive and emotional processes. To test this hypothesis we have prospectively assessed 172 patients after an ischemic stroke with magnetic resonance imaging (MRI) and clinical evaluations within the first 3 days and at 1 year follow-up. Especially MRI protocol included a specific method to quantify iron accumulation (called R2*) considering that iron accumulation has been associated with markers of neurodegeneration in previous animal studies. We have also developed a unique thalamic atlas that allows quantifying iron accumulation, and therefore neurodegeneration, within individual thalamic nuclei in vivo. The 3D brain shows projection of the infarct voxels significantly associated with iron accumulation within the medio-dorsal nucleus (blue) and the pulvinar (yellow). Merged blue and yellow colors appear in green. Illustrative example of an anterior infarct (blue) that is associated with focal iron accumulation within the medio-dorsal nucleus (blue arrowhead and enlarged view of R2* map overlaid with the blue mask of the medio-dorsal nucleus). Ultimately such modification within the medio-dorsal nucleus is a significant and independent contributor of post-stroke deficit especially with a post-stroke cognitive and depression profile. Illustrative example of a posterior infarct (yellow) that is associated with focal iron accumulation within the pulvinar nucleus (yellow arrowhead and enlarged view of R2* map overlaid with the yellow mask of the pulvinar nucleus). Ultimately such modification within the pulvinar nucleus is a significant and independent contributor of post-stroke deficit especially with a post-stroke cognitive and anxiety profile. • Iron accumulates within the thalamus ipsilateral to an infarct initially sparing the thalamus after a delay. • Importantly thalamic iron accumulation is not diffuse but actually appears with a focal distribution pattern especially within the medio-dorsal and pulvinar nuclei. • The nucleus that is involved is strongly determined by the initial infarct location, in line with the known connectivity between thalamic nuclei and cortical areas or deep nuclei. • Such secondary alterations contribute independently to the post-stroke functional, cognitive and emotional outcome. To conclude, R2* mapping overlaid onto an accurate thalamic atlas is a suitable method to demonstrate and quantify secondary remote neurodegeneration after infarct at the scale of the thalamic nucleus, in relation to the pattern of connectivity between thalamic nuclei and cortical areas or deep nuclei. These secondary lesions have the potential to independently impact long-term outcome especially cognitive and emotional outcome. 1er auteur: Gregory Kuchcinski MD, department of neuroimaging, Lille University Hospital. 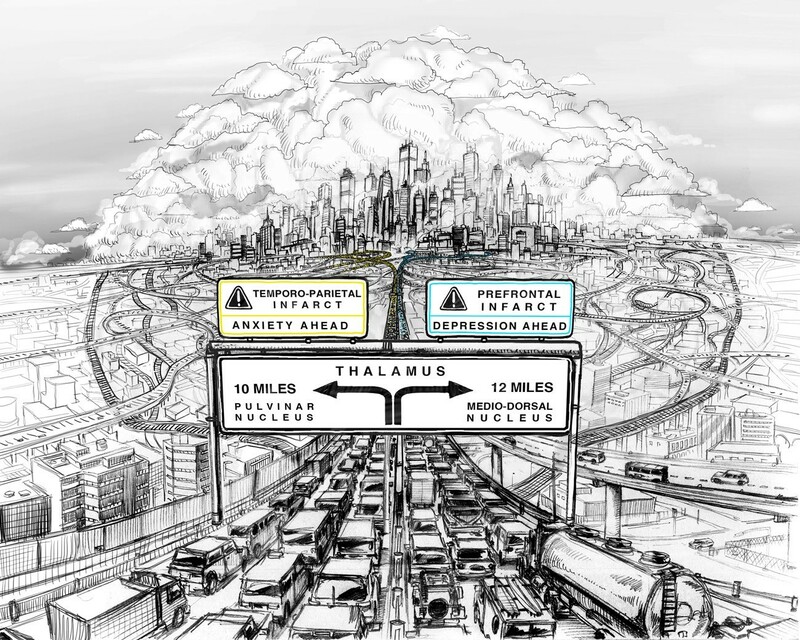 The thalamus is like a central hub in a city. Different roads lead to different regions of this hub and any alterations along the road (stoke) will impact specific regions of the hub with specific consequences on the network.